The ATF just reversed their position concerning the “shouldering” of a pistol brace – it no longer magically converts a pistol into a rifle. 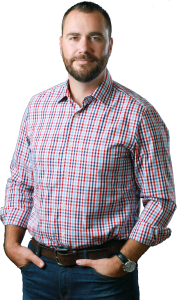 This is huge news for our industry. AR-15 pistols can now be fired from the shoulder without the shooter being in fear of being put in jail (or harassed by a poindexter at the range). 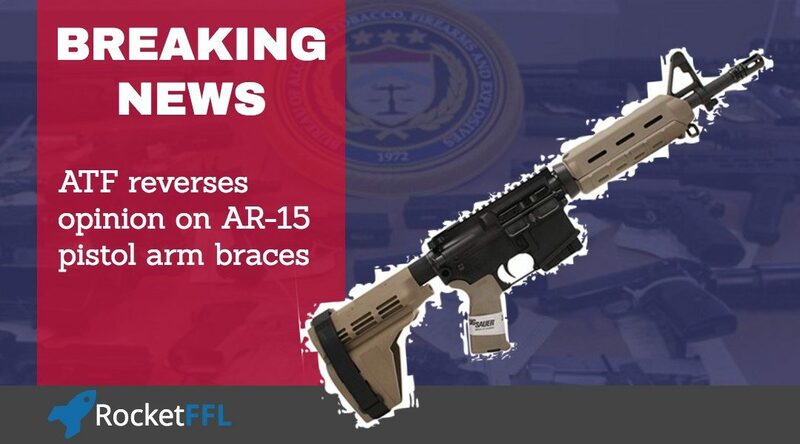 If you’re an FFL dealer, you might want to look into getting some “AR-15 Arm Braces” as fast as you can because there’s likely to be a rush of customers. If you’re an FFL manufacturer, you might want to consider making AR-15 pistols with arm braces because they’re about to be super popular again. 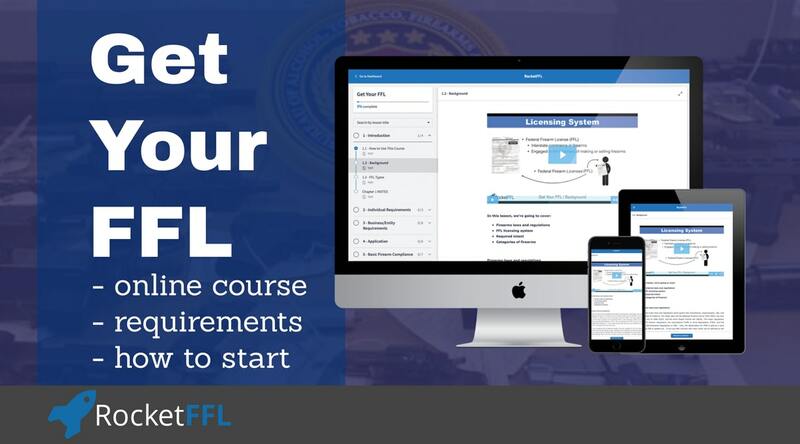 If you’re not an FFL yet, why not? Go sign up for our Get Your FFL Guide and get one now! Better yet, sign up for our Become an SOT course while your at it and you can make an SBR (or any other NFA item) whenever you want without any wait-time or the need for approval from the ATF! To understand what happened, and its significance, we must cover a few basics first. A rifle is a firearm that “is designed and intended to be fired from the shoulder and has a rifled barrel.” Any rifle that has a barrel length of less than 16 inches or an overall length of less than 26 inches is a “Short Barreled Rifle” (SBR) and is subject to extra regulations and control under the National Firearms Act of 1934 (NFA). The NFA was intended to help control especially “dangerous weapons” that were being used by gangs at the time. These SBRs were a concern because they were easy to conceal. Yes, handguns are even easier to conceal, however, the ability to shoot a firearm from the shoulder gives much more control to the shooter than just firing it by hand. SBRs require a transfer tax and an approval process prior to being transferred (changing possession/ownership/control). If you’re not an FFL, this means that you can make an SBR on your own only after filing a Form 1 with the ATF, paying $200 to the federal government, getting fingerprinted, sending in a passport photo, waiting for a few months, and hopefully receiving approval from the ATF. Or, you could purchase an already made SBR from a gun store or private seller by filling out a Form 4 with the ATF, paying $200 to the federal government, getting fingerprinted, sending in a passport photo, waiting for a few months, and hopefully receiving approval from the ATF. Of course, if you were an FFL dealer, you could get an SBR from another FFL on a Form 3 (without the $200 check, the fingerprints, nor the passport photo) in much less time. And, if you were an FFL manufacturer, you could just make one in 30 seconds and be done with it. Sounds like being an FFL is a good thing, right? In 2013, longer ago than the average attention span of today’s internet user, a product was invented: the Pistol Stabilizing Brace. This device was installed on a buffer tube of an AR-15 in lieu of a shoulder stock and was “designed” to be used as a cuff around the shooter’s forearm. It looked like a very short shoulder stock – it even had some very similar design characteristics such as the same side-profile and some horizontal groves. The new Pistol Stabilizing Brace was quickly picked up by Sig and took the industry by storm. This device allowed people to create AR-15s with short barrels without having to deal with the restrictions, cost, and hassle of dealing with an actual SBR. Because the device was not “designed and intended to be fired from the shoulder,” the firearm did not meet the basic definition of a rifle. Therefore, if it was’t a rifle in the first place, it could’t be a Short Barreled Rifle (SBR). In my opinion, AR-15 pistols in .223 Rem are kinda’ pointless but they sure were popular. Although not exactly the most comfortable way to use them, they could easily be shouldered and would allow someone to shoot an AR-15 pistol like it was a rifle. Remember, the law didn’t say “used from the shoulder,” it says “designed and intended.” Therefore, as long as the inventor claimed that he designed and intended it to be used from the forearm (he did), everyone was good to go. These things popped up EVERYWHERE until early 2015. 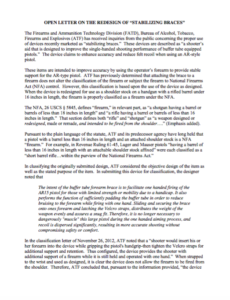 During an industry meeting with the ATF at SHOT Show 2015, I argued with the ATF over this absurd determination. Outside the meeting room I was told by two very senior members of the ATF that this was a determination based on a request they received from someone who had rolled a towel and inserted it into the arm cuff of the brace and then wrapped the thing in duct tape thereby making a shoulder stock. This person apparently sent in pictures and asked the ATF if it was a brace. To this day I don’t know if it was a foolish gun owner or an anti-gunner looking to make a stink. They insisted to me, in person, that merely shooting a pistol from the shoulder didn’t make a rifle. They agreed with my arguments that the law focused on “designed and intended” and that subsequent use didn’t redesign something. They clarified that only if someone went through the effort to make something new or truly redesign the pistol brace was it an issue. I told them that they should have written that in their letter because as it stands, use = redesign. I appreciate these relationships I have in the ATF – I have respect for both of these guys and, believe it or not, I understand the position they were in. I also think the letter was either worded poorly or the ATF wanted the result. AR-15 pistols have long been a thorn in the side of ATF. After all, they are what started the whole problem with ammunition that was normally considered to be rifle ammunition being treated as handgun ammunition for purposes of banning armor-piercing handgun ammo (this is a story for another day). To be fair, “redesign” is in the law. The NFA defines both rifle and shotgun to include any “weapon designed or redesigned, made or remade, and intended to be fired from the shoulder.” Presumably this was to cover people sawing off a shotgun barrel at home. 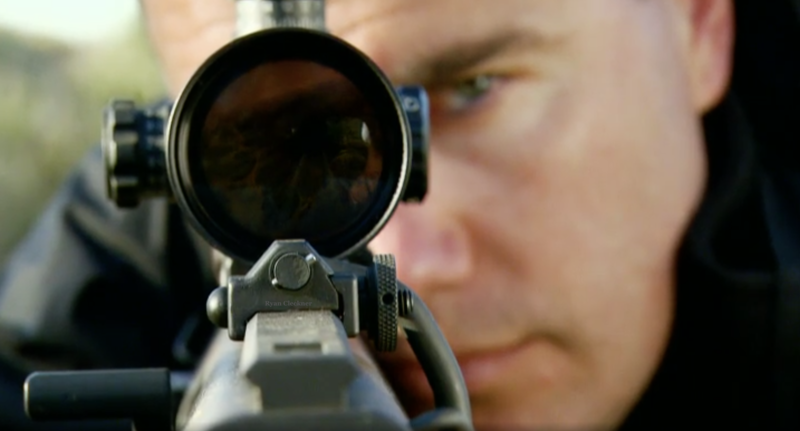 They would have then redesigned a shotgun into a Short Barreled Shotgun (SBS). “The pistol stabilizing brace was neither “designed” nor approved to be used as a shoulder stock, and therefore use as a shoulder stock constitutes a “redesign” of the device because a possessor has changed the very function of the item. Any individual letters stating otherwise are contrary to the plain language of the NFA, misapply Federal law, and are hereby revoked. 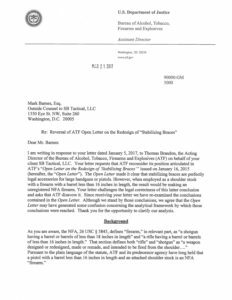 In a March 21, 2017 letter from the ATF to the inventor of the Pistol Stabilizing Brace, the ATF reversed its opinion. 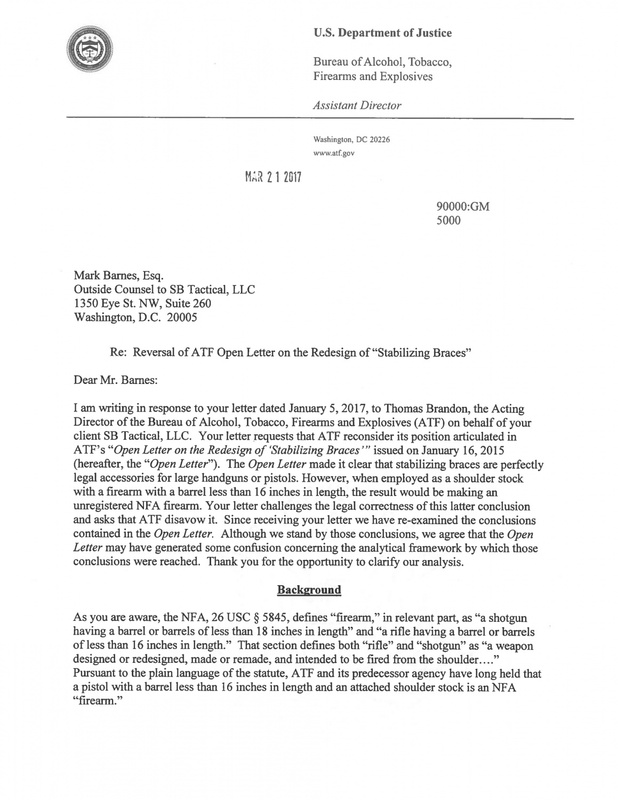 The ATF says they just clarified a misunderstanding, but the industry was stuck with what they put in black and white on paper, not what they may have meant. The ATF finally acknowledged that their concern was about people who took actual steps to re-design something into something new. For example, the letter explains that if the Pistol Stabilizing Brace was mounted long enough down a buffer tube to prevent its use as an arm brace and instead was at a length that was only useful as a shoulder stock, then they have redesigned it into a shoulder stock. This is all good news – although some of it is questionable. For example, what is this new mystery length that can only be suitable for use as a shoulder stock? Exactly where is the line drawn when determining what is a redesign? What constitutes a redesign of a pistol brace? Therefore, if you install a Pistol Stabilizing Brace on an AR-15 pistol as it was intended to be installed (on the buffer tube and up against, or at least close to, the rear of the receiver), then you have not “redesigned” anything. If you then fire that pistol from your shoulder, you haven’t changed the original designer’s intent and you haven’t redesigned it. Be careful. While this applies to all pistol braces, you must ensure that what you have is actually a pistol brace and the firearm you are dealing with is a pistol in the first place! Just because a manufacturer calls their product a pistol brace doesn’t necessarily mean that the ATF agrees. Also, you may not have a non-NFA pistol – for just one example, if the pistol has a smooth barrel and is designed and intended to shoot shotgun shells, it might be an Any Other Weapon (AOW). This is good news. Pistol Stabilizing Braces may be fired from the shoulder as long as other affirmative steps have not been taken to alter, modify, nor configure the pistol stabilizing brace as a shoulder stock. Mr. Cleckner could you please explain why? They are legal, but the ATF doesn’t necessarily like it. They are a bit of a loop-hole in the law. With pistol braces, they are effectively non-NFA SBRs. Same “firearm,” same capacity, same bullet, only a different stock. Although other handguns can fire “rifle cartridges” they view these as more of a public/officer safety threat. The big push recently ( a few years ago) on classifying typically rifle cartridges as handgun cartridges for the armor piercing handgun ammo ban was blamed on the popularity of AR-15 pistols. I understand BATFE not liking things, I occasionally deal with them professionally. Thanks Ryan, you did a superb job clarifying the muddled definitions for the rest of us simpleminded Americans. What if you modified your SBR shoulder stock to be a pistol brace? Would it no longer be a SBR?